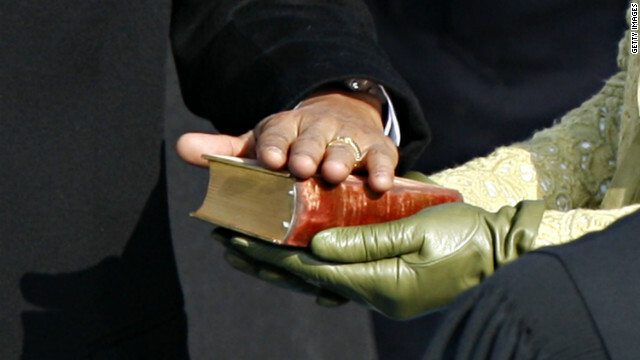 In 2009, President Barack Obama was sworn in using the same bible used by former President Abraham Lincoln. The Lincoln bible will make an appearance in this inauguration as well. Honestly, many hate America, but what other power is better? You would live under Soviet rule? Be grateful for what you have, and speak not of what you do not. Lincoln spoke truly when he called America God's almost chosen people, more truly than he and most realize. Kind of a bizarre word choice since it's the completely erroneous libel liberals assault the Jews with every day. Thitle:"My Take: An almost chosen nation" Do I have to read the article before I post? More lies from the xtians – 139! Poor guy endlessly shills his conspiracy theory about atheists being shills. You do know that the same can be said about you. And I hate to break it to you but atheists come here out of their own free will, Not to mention we don't have anywhere near the lobby or funding you religious people do. So it's a lot more likely that the only "shills" here would be the religious. Obama should have put his hand on a copy of the U.S. Consti'tution. After all, isn't that the very docu'ment he's swearing to preserve, protect, and defend? He's not swearing to protect the bible or any religious "laws", just the Consti'tution. It would make more sense, but would you be the one to ask him to swear on a docu'ment, even if since amended, that listed a black man as worth less than a white man? I don't know why Obama used Lincoln's and King's bibles. He is nothing like either man. Lincoln is probably rolling over in his grave. If anything, Obama has undone more of Lincoln's work in the last 4 years than any other president. Could you be a bit more specific, Dhimmi?